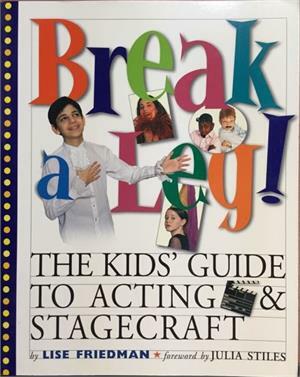 A complete drama course for kids in a book. BREAK A LEG! teaches budding thespians everything they need to know about stagecraft and the production of performances, in home or out. Illustrated throughout with informative how-to and candid shots of young working actors, BREAK A LEG! is as comprehensive as it is high-spirited. There are sections on body preparation, including warm-ups, stretches, and breathing exercises. Theater games, improv, miming, and other fun ways to develop technique. Important acting skills, such as voice projection, crying on command, learning accents, and staging falls and fights without getting hurt. Theperformance: analyzing scripts, building a character, what to expect from rehearsals, and overcoming stagefright. A backstage look at blocking, lighting, and other technical aspects of theater production. And for the fun of costumes and make-up, a 16-page color insert. In addition, it covers legends and lore (Why is Macbeth cursed? Why do we say "break a leg"?) and offers dozens of must-see movie recommendations. Plus, for the ambitious, talented, and just plain curious, there's advice on how to make a career of it all, with tips on agents and auditions and getting jobs in theater, film, TV, and radio.